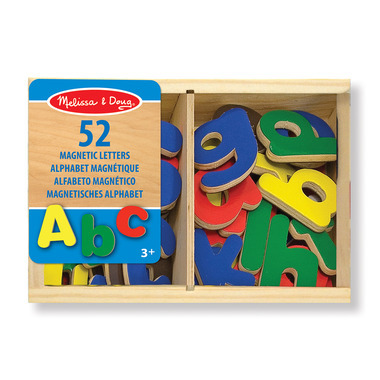 These 52 magnetic uppercase and lowercase letters make a colourful jumble of learning possibilities in their handy wooden case. 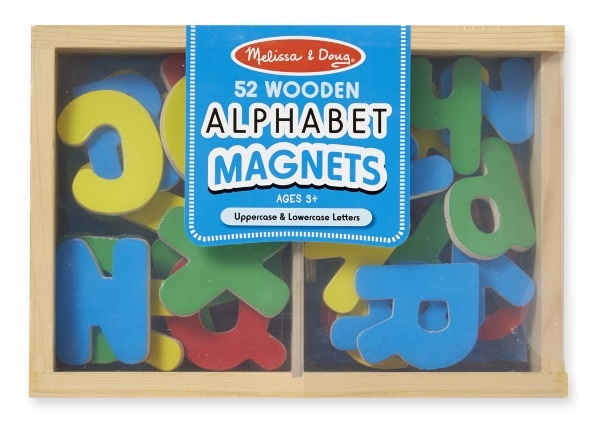 Ideal for letter recognition, matching, and stenciling, these must-have letters spell "learning fun"! Suitable for ages 3 years old and up. Letters are perfect size and colour. Magnet is strong/good quality. Paint on the letters is poor quality as the letters were chipped on the edges when I received them and got worse with use. My toddler enjoys playing with these. They are a great size and shape, and are easily manipulated by small hands. The magnets are strong enough to work on the front of our dishwasher with it opening and closing regularly. Numbers would have been a good addition to the set. Letters are esay to remove and manipulate. They are sturdy as well. I just did not read enough on the product... For a 3 years old, I do not see the use of capital letters vs lower case letters. I think capital letters and numbers would have been a great match. I set these up with muffin tins & baking sheets - possibilities are endless - We make alphabet "cookies" or "muffins", or line up alphabet trains. Helps with recognition and simple spelling. Purchased for my 4 year old and it is a hit! Sturdy construction. Like that the b, d and p have their own colors so that early learners can better distinguish between the letters. Only thing my little one has trouble with is getting them all back in the box. Good and sturdy, helps with letter recognition and firming simple words. Play on the fridge or another metal surface like a cookie sheet. This is such a great toy to help my little one learn the alphabet. I especially love the fact that the magnet is flush on the back so there is no chance of it coming off, looking delicious, and then being digested. I am disappointed with the size, it's very thin wood. I thought it would be better quality like my other M & D products. My boy has chewed several pieces ruining the paper top.